This entry was posted on Tuesday, July 29th, 2008 at 8:16 am	and is filed under Humor/Fun, Soc/Pol/Econ. You can follow any responses to this entry through the RSS 2.0 feed. Both comments and pings are currently closed. I’m wondering what forces sustain this attitude in the U.S. I’m not sure it exists as strongly in other cultures? Do you think initiatives to encourage women (or minorities) in STEM can inadvertently perpetuate the above stereotype? What did happen, was that I chose to study “soft sciences” in the end (I’ve got a degree in ethics and am a primary school teacher) and not the more male oriented hard sciences — even though I excelled in those. Frances – I’m shocked that you have never encountered this behavior in life (whether in the realm of math or something else). 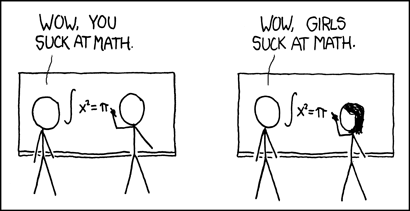 The cartoon isn’t really about math per se, it’s about how a specific incident with one person is then applied to a generalization about a whole group he or she is a member of (gender and math are a specific case here to illustrate a more general point). And why do you think it is that girls and women don’t pursue math and science careers when attitudes and generalizations of this sort are what they encounter throughout their lives? eszter: Thing is, I don’t seem to have encountered it this blatantly. But of course there is a tendency of categorising behaviour as male or female. Maybe I didn’t “get” that at first while reading the cartoon, because these projections are often positive. “Women are so good caretakers. Women can juggle different tasks at once better.” Blatant negative comments on the “female nature” is something that is not done. The attitudes and generalisations are never overt. Choosing then seems to stem from a will to conform to implicit social norms (but that’s probably what you said anyway). This works both ways: my job is almost 100% feminine, because the guys don’t tend to choose for a teaching career in primary school. In the higher echelons of education on the other hand, the ratio is turned around. We can take the question further then: How come we seem to prefer, both regarding pay and standing, those jobs mainly done by men? An interesting addition: Technopolis (a science museum here in Belgium) had technology labs for girls where they could work with tools etc. These were girls-only because they noticed when there were boys the girls would still ask them to drill holes. I do think initiatives like this exist abroad.